In 1931, Diego Rivera (actually Diego María de la Concepción Juan Nepomuceno Estanislao de la Rivera y Barrientos Acosta y Rodríguez — whew, what a name!) painted The Making of a Fresco Showing the Building of a City at the San Francisco Art Institute. The mural is a meta-mural because it is a mural about murals and because it represents its creators in the act of creating the fresco itself. Rivera produced three murals in San Francisco (the first city outside of Mexico City in which he would paint frescoes, an art form he revived). Architect Timothy L. Pfleuger (who designed the glorious Castro Theater) invited Rivera to San Francisco to paint a mural for the City Club in the San Francisco Stock Exchange. Allegory of California “shows the Amazon deity Califa (our state’s namesake) dwarfing a tableau of workers from the region’s industries” (sfweekly.com). At City College of San Francisco, Rivera painted Pan American Unity, depicting workers from South, Central and North America. As we have seen, workers were Rivera’s primary subject. Why? 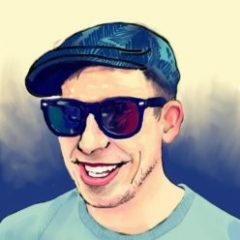 Rivera was a communist. You can see a picture of Josef Stalin in the City College mural, holding a bloody ax, appearing side by side with Adolf Hitler and Benito Mussolini, a trio of tyrants. Rivera, a Trotskyist, blamed Stalin for the assassination of Leon Trotsky and the derailing of the revolution in the Soviet Union. Trotsky lived with Rivera — and even had an affair with his wife, the soon-to-be famous painter Frida Kahlo, after he had fled Russia. When commissioned to paint a mural for the Chrysler building, Rivera included a portrait of Vladimir Lenin. Naturally, this upset the ultra-capitalist John D. Rockefeller, who ordered Rivera to remove the portrait of Lenin. When Rivera refused, Rockefeller had the mural painted over and now the Chrysler mural can only be seen in photographs. 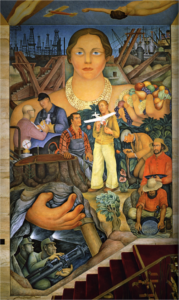 In the City College mural Pan American Unity, Rivera included a portrait of the worker he knew best: himself. Rivera wanted to connect art, often seen as an elitist profession, with the labor of the common worker, so he depicted himself as “one of the people,” a blue collar worker, fighting for the rights of the worker with a paintbrush. You can see this self-reflective element in the detail on the right. Rivera took the self-reference in Pan American Unity to new heights in his mural The Making of a Fresco Showing the Building of a City. Again, Rivera shows himself working on a mural, but this time we see the mural through the trompe l’oeil scaffolding, portraying the very process of creation. The painting then has two levels: one showing the building a city and another showing the creation of the fresco. In early sketches, the levels were clearly separated, but in the final version, one world blends into the other: “In the upper right section showing the steelworkers, the wood scaffold structure continues in the fresco-within-the fresco as steel girders, and, although the workers in the foreground are the same size as the figures on the wood scaffold, the scene depicted is clearly not within the gallery space. The three architect/engineer figures in the lower right panel are ambiguous—are they painted or working on site in a very confined space? Is the blue rectangle behind them an open window or a blueprint? Most likely it is a blueprint, since other rolled prints are leaned against the wall nearby” (From the San Francisco Art Institute website). 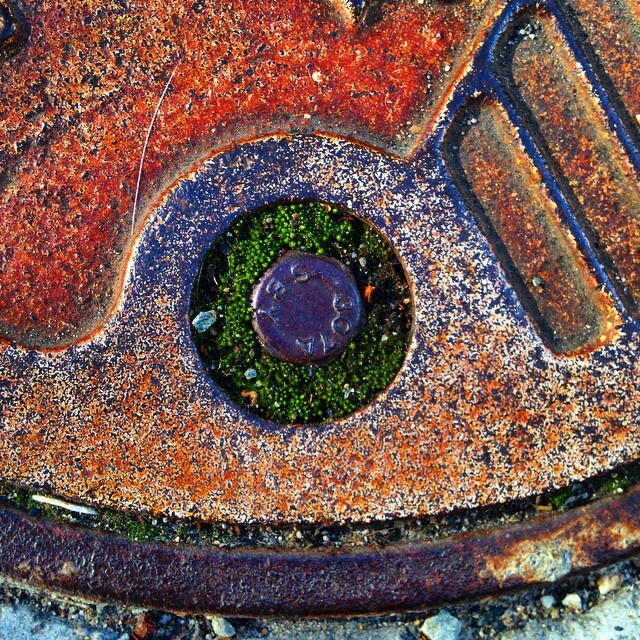 This blending of levels of reality is another meta-element common in metafiction and meta-paintings. 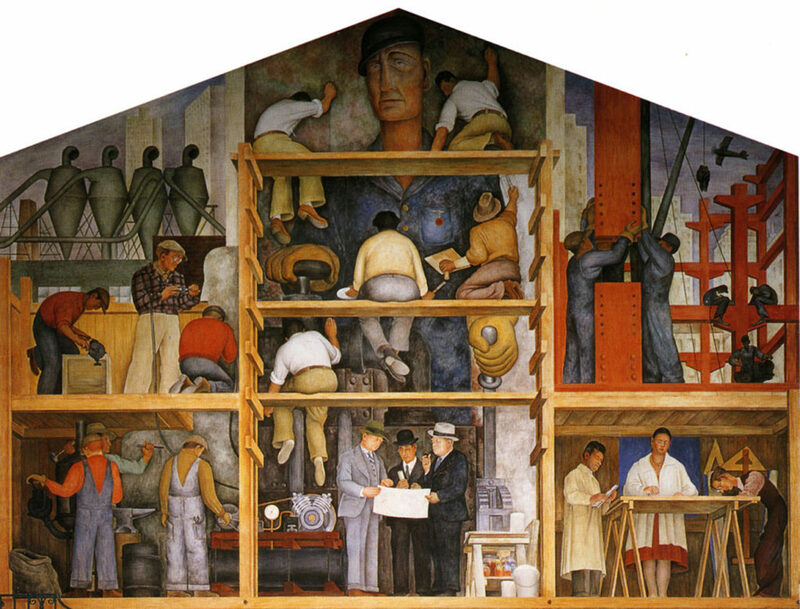 Rivera also depicted his team of plasterers and painters (a fresco is not a solo project), as well as other artists and patrons of the arts: “At the center of the upper central panel is Rivera, who has painted himself sitting on the scaffold with his back to the viewer, holding a paintbrush and a palette. He watches his assistants working above him: Clifford Wight again, wearing corduroy pants and a white shirt, upper left, holding one end of a vertical chalk line, and, on the upper right, holding the end of another, diagonal chalk line, which passes directly behind Rivera’s head; and Mathew Barnes, the plasterer, to Rivera’s right—applying the wet plaster ground around the largest figure in the fresco, a worker operating the control levers of a machine. Below and to the left of Rivera, Wight appears again holding the other ends of the two chalk lines. On the scaffold below Rivera stand three men wearing suits and hats, looking at a large piece of paper: (from left to right) architect Timothy Pfleuger, who designed the San Francisco Stock Exchange, the location of another Rivera mural; William Gerstle, president of the San Francisco Art Association, who commissioned The Making of a Fresco; and Arthur Brown, Jr., architect of the school’s new building, Coit Tower, City Hall, and many other San Francisco landmarks. . . .In the lower right panel architect and painter Michael Goodman, who worked with Pfleuger, stands at the side of a drafting table, holding a scale ruler; Geraldine Colby Frickie, an architect and designer, stands behind the table, holding measuring calipers; and Albert Barrows, an engineer who turned Rivera’s sketches into full-scale cartoon stencils for the mural, bends over the table” (San Franicsco Art Institute). Again, Rivera was attempting to show himself and his fellow artists as workers engaged in the struggle for economic equality. During the great depression, there was a great deal of sympathy and respect for the worker, as can be seen in the art, architecture and music of the period, thanks in large part to Rivera’s influence. The common focus on workers essentially vanished from North American art during the cold war and red scare of the 50s and 60s. Now, as we are struggling against growing economic inequality, it is time to bring the worker — and the artist as worker — back into our art. (For more about meta murals, read my post Repainting the Tenderloin: Mona Caron’s Meta-Mural and A Meta-Mural on Clarion Alley: Lo Llevas por Dentro by Jet Martinez.